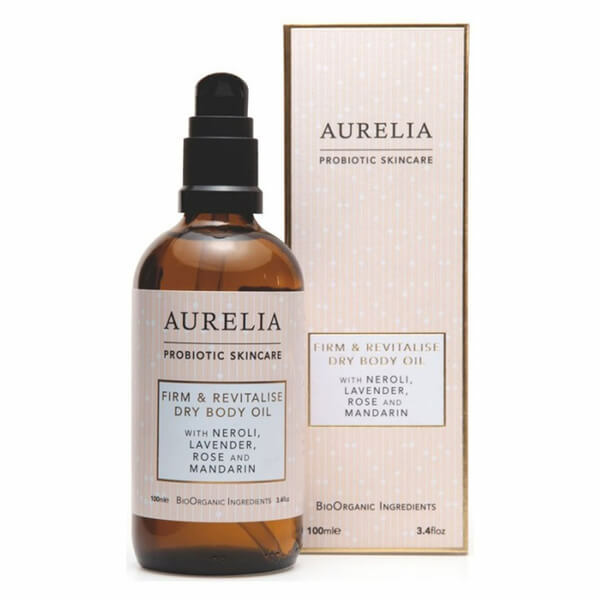 Treat dry, wanting skin to Aurelia Probiotic Skincare Firm and Revitalise Dry Body Oil, a luxurious dry oil formula that works to firm the appearance of and deeply hydrate lack lustre skin. Delicate yet intensely nourishing, the moisturising formula utilises a host of sumptuous ingredients to promote hydrated, healthy-looking skin. Its signature essential oil blend of Neroli, Lavender, Rose and Mandarin fuses with antioxidant-rich BioOrganic botanicals to revitalise the skin whilst calming the senses to ease feelings of stress. Melting effortlessly into skin thanks to lightweight Kalahari oil, the formula's cocktail of precious oils (Macadamia, Borage, Mongongo and Kukui) deliver essential fatty acids and antioxidants whilst hydrating and repairing. Skin experiences restored hydration and is left beautifully scented. Apply after a shower or bath when the skin is still damp to help lock in moisture and intensify the effects of the oil blend. Use directly onto dry skin to achieve an instant radiant glow. Apply before a shower or bath to allow the relaxing essential oils to permeate in the heat. Blend with your body moisturiser for supercharged hydration. Use after hair removal to soften and smooth skin. Coco-Caprylate, Dicaprylyl Ether, Macadamia Ternifolia Seed Oil, Prunus Persica (Peach) Kernel Oil, Aleurites Moluccana Seed Oil, Simmondsia Chinensis (Jojoba) Seed Oil, Citrus Aurantium Dulcis (Orange) Flower Oil, Citrus Nobilis (Mandarin Orange) Peel Oil, Borago Officinalis (Borage) Seed Oil, Citrullus Lanatus (Watermelon) Seed Oil, Schinziophyton Rautanenii Kernel Oil, Tocopherol, Tocopheryl Acetate, Lavandula Angustifolia (Lavender) Oil, Rosa Damascena Flower Oil, Citral*, Citronellol*, Farnesol*, Geraniol*, Limonene*, Linalool* (*naturally occurring in essential oil).